From the high ground on which Dover Castle stands, a narrow road called Upper Road drops down into the valley behind before climbing up the other side and running along the top of the famous white cliffs. At two points along this road, only a mile or so apart, are two rather lonely but important memorials. The road which links them is quite narrow in places, doesn't lead to anywhere specially famous and doesn't get too much traffic, so it's probable that most of Dover's transient visitors will never have seen them. Both memorials remember the feats of early fliers. 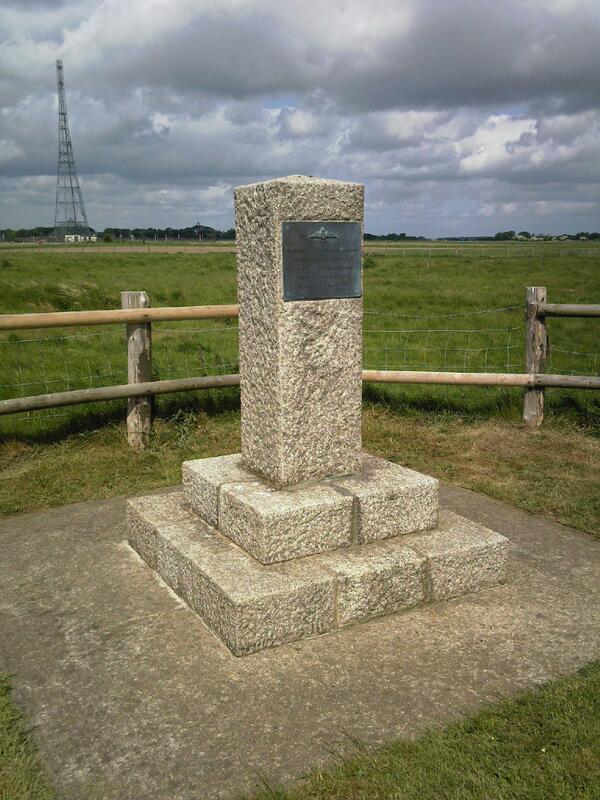 Both memorials commemorate significant pioneering flights across the English Channel. One marks the exact spot on which Louis Blériot landed at the end of his historic first flight across the Channel from France on July 25th, 1909. The other marks the entrance to the field from which, on 13th August, 1914, the Royal Flying Corps made the crossing in the opposite direction, when it crossed to France at the beginning of the Great War. We often hear how war can bring about huge strides in the development of new ideas, and the development of aircraft (in both world wars) is often quoted as an example. In the four years of the Great War , flying machines developed from the primitive into the sophisticated. Without the need to develop aircraft as weapons, it is unlikely that so much progress would have been made in so short a time. The historic pioneers like Blériot and, of course, the Wright Brothers before him, carried out their experiments as enthusiasts - almost as hobbyists. No doubt the early Royal Flying Corps pilots saw themselves as the same kind of pioneering enthusiasts as much as they saw themselves as soldiers (the RFC being part of the Army in those days). They all - Blériot and the Royal Flying corps alike - began by flying into the unknown. Blériot's flight into the unknown ended at Dover after 32 minutes. For the Royal Flying Corps, the "unknown" was still very much ahead of them, stretching far into the future. 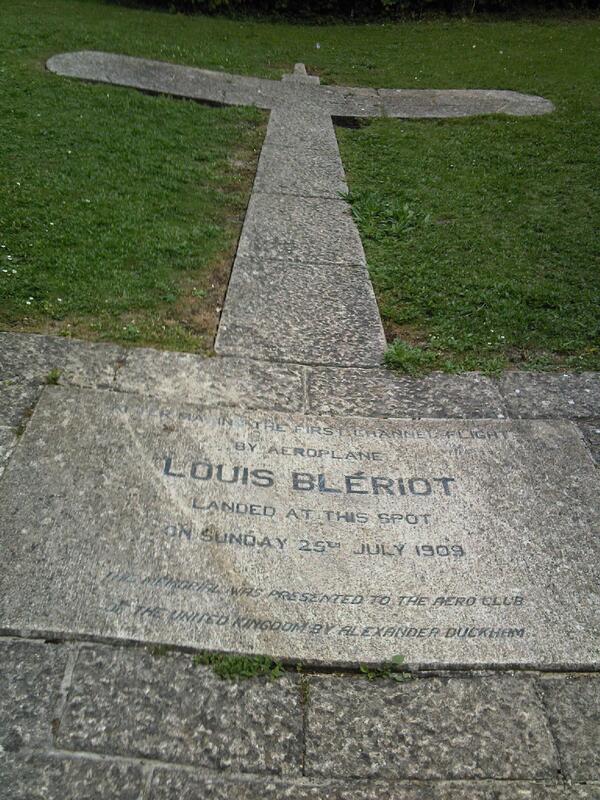 Blériot's cross-channel flight of 1909 is commemorated by a granite outline of his aircraft set into the ground on the exact spot on which the plane came to rest. It is only accessible by a footpath which passes the site, and one end of the footpath is in Upper Road, where there is a signpost pointing the way to the memorial. The landing site today is a very small clearing, surrounded by thick woodland, causing some visitors to wonder how on earth Blériot managed to find such a confined space, let alone land in it. The answer is that the whole hillside was open grassy fields in 1909. 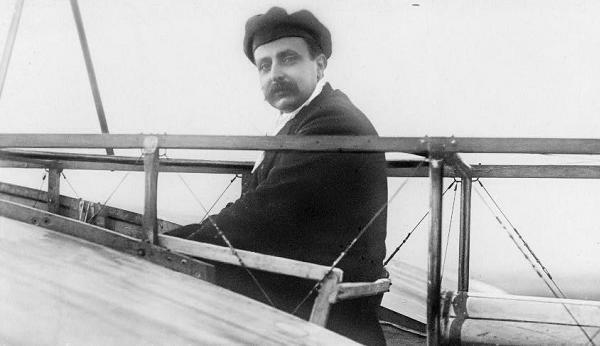 Blériot was born in 1872, near Cambrai. He studied engineering in Paris and made his not inconsiderable personal fortune as the owner of a factory that manufactured acetylene gas-lamps for motor cars, to his own excellent design. He used his wealth to finance his interest in aviation. He taught himself to fly in 1906, becoming one of the first eight fliers to be awarded competence certificates. In his aeroplane designs, Blériot always placed his faith in the monoplane principle, even when his own experience suggested that a single wing might not be the best way forward. He and his planes crashed many times and although the aircraft were sometimes totally wrecked, Blériot himself always managed to walk away from the splintered wreckage and start again learning from the mistakes of the previous model. The aircraft which successfully flew the across the English Channel was the Blériot XI - quite some way down the development road! The aeroplane was fitted with a 3-cylinder Anzani engine which, Blériot knew, could usually be relied upon to run for an hour on the test-bench before some problem caused it to stop. This doesn't mean that an aircraft fitted with this engine could actually fly for an hour. Running on a test-bench was one thing. Running on an aeroplane in the air was quite another. In those pioneer days, no-one had yet achieved a flight lasting an hour. The early flyers could never be certain how far their aircraft would take them. A week before his cross-channel flight, Blériot had managed a non-stop flight of 25 miles, not quite enough to equal the distance required for a channel crossing. As soon as powered flight became a more or less reliable reality, the Daily Mail newspaper supported the pioneers by organising races and putting up prizes, thanks to the interest of the paper's owner, Lord Northcliffe. In 1908, the paper announced that it would award a prize of £500 to the first pilot to make a flight across the Channel, between sunrise and sunset, flying in either direction. When no-one came to take up the challenge, the prize was increased to £1,000 for 1909. This had the desired effect, and although four pioneer fliers expressed an interest, two of them were not quite ready to fly when the chance of the best weather came, leaving only two to battle it out, Louis Blériot and Hubert Latham, a wealthy sportsman who, although he was a director of the Antoinette Company which made his plane, was more an enthusiastic (but very skilled) amateur than a serious designer and tester, as Blériot was. Latham made the first attempt on July 19th, but engine failure cause him to ditch his plane in the Channel and wait sitting on the floating machine until rescue came in the shape of a French torpedo boat. On the weekend of July 28th and 29th, Latham was planning another attempt but bad weather on the Saturday made a flight on the Sunday look unlikely. On the Sunday morning, Latham's Antoinette was prepared for flight but the weather was once again too rough. Switching off his engine at about 8.00 a.m., Latham looked at the sky for any signs of improved weather later in the morning. Actually, it was all academic now, anyway. The English Channel had already been crossed by air. Blériot had been studying the weather around Calais and had guessed that his best chance of good weather would be early in the morning. He had taken his plane for a warm-up flight and then, after a refuelling and a few quick checks, he had set off at 4.35 a.m.. A few miles out to sea a French warship was waiting to cross with him, monitoring his flight, but Blériot's aircraft was performing so well, flying at about 45 miles per hour, that he eventually caught up with the ship and passed it, hoping that he could maintain his course without being able to see the ship's direction. Having no compass, he was flying by observation alone now and eventually he saw the English coast before him. He correctly identified the town of Deal ahead, and changed his course to the West, looking for Dover, where a signal had been arranged for him. A man on the ground would wave a Tricolour to indicate a good landing-site. The site chosen, of course, is the site of today's Blériot memorial. 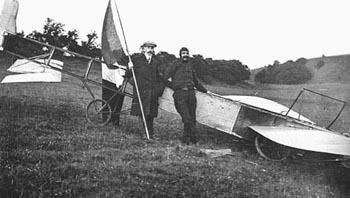 Blériot was faced with a difficult landing on a sloping hillside and he came down hard, damaging part of the aircraft's frame. His flight had lasted 32 minutes. Only a local policeman and Fontaine, the man who waved the flag, saw the landing. The news, however, travelled around the world. It was an event of international importance and even today, still one of the most significant events in the history of flight. Blériot, friend and aeroplane, before the crowds arrived. The Royal Flying Corps was formed almost three years after Blériot's historic flight under a Royal Warrant of 13th April, 1912. The army already had a unit dedicated to flight, the Air Battalion of the Royal Engineers. The Battalion had two companies. No. 1 Company flew airships and kite (tethered) balloons while No. 2 Company, based at Larkhill on Salisbury Plain, was equipped with aeroplanes. These became part of the new Corps which, by the end of 1912, could boast a Military Wing, a Naval Wing, a Reserve, a Central Flying School, a Royal Aircraft Factory, an airship, 12 manned kite balloons and 36 aircraft - many of them Blériots which resembled the cross-channel machine but which had larger engines and two seats. (After his famous flight, Blériot's order-books received a colossal boost, as may be imagined). When the Royal Flying Corps prepared to fly to France in August, 1914, it assembled four squadrons (2, 3, 4 and 5) each with 12 aircraft. There were also spare aircraft to be flown to France to establish depots. All these machines assembled in a field at the top of the cliffs, just to the north of the present Eastern Docks complex. The field was later to become part of the RAF Swingate site but in 1914, it was just a good flat field, close to the cliffs. Today, the gate into the field from the clifftop road between Dover and St. Margaret's at Cliffe has a small granite pillar with a plaque attached. 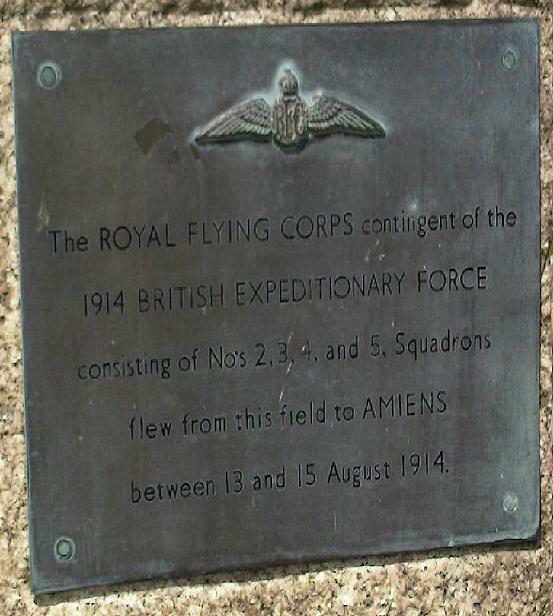 The ROYAL FLYING CORPS contingent of the 1914 BRITISH EXPEDITIONARY FORCE consisting of Nos 2, 3, 4 and 5 Squardrons flew from this field to AMIENS between 13 and 15 August 1914. The air of excitement and anticipation in that field on 12th August, as the RFC assembled, must have been intense, and there must have been much work to do both in preparing the machines for the air and also in keeping them firmly on the ground in that windy spot. The sight of sixty planes all in one field must have been quite something. The RFC had enough men to care for them all, though. By the time the Corps had established itself in France a few days later, it had 900 men serving overseas. Even before its assembly had been completed, the RFC had already suffered its first wartime fatalities. On 12th August, Lt. Robert R. Skene and Airman R. Barlow were killed when their aircraft crashed en route to Dover, just a couple of minutes after taking off. An inquest held at Salisbury found that when the accident happened, the aircraft, which was one of the RFC's Blériots, was heavily loaded as it was flying under active service conditions. Just over Netheravon, Lt. Skene made a sharp left-hand turn and this caused the machine to dive from a height of 150 feet The jury returned a verdict of Accidental Death. Lieut. Skene was 23 years old, had received his pilot's certificate in July, 1913 and had been commissioned into the RFC in November of the same year. He had already carved his own niche in aviation history, for he had been the first man in England to loop the loop. Lieut. Skene's grave is in St. Mary's churchyard, Send, Surrey. Airman 1st Class Raymond K. Barlow is buried in Bulford Cemetery, a burial ground associated with Bulford Camp, which is one of the training camps on Salisbury Plain. (For some reason, the Commonwealth War Graves Commission's online records give R. K. Barlow's date of death as 10th August). In all, 60 aircraft left for France on 13th August, 1914, when 2 Squadron led the Royal Flying Corps to war. (No. 5 Squadron followed two days later). The first contingent flew across the Channel from Dover to Boulogne and then used natural features to help them navigate. They flew down the French coast to the Bay of the Somme and then followed the course of the river inland to Amiens.After just over a year in France, by September, 1915, the RFC had twelve squadrons and 161 aircraft. By the 1st July, 1916, the day on which the Battles of the Somme began, the RFC had 27 squadrons with 421 aircraft and 216 more in depots. The further development of the RFC is well recorded elsewhere, and so is its later history right up to the present day Royal Air Force. My story is just a small one, concerning a little plaque at the gate to a field where it all started. The memorials are so conveniently close to each other that it's not difficult to visit them both. Probably the easiest way is to drive towards Dover's Eastern Docks and at the very last roundabout before entering the docks, take the right-hand road, the A2, named Jubilee Way, as it climbs up and round, over the docks buildings. At the top of the hill, at a roundabout, take the first exit onto the A258, which will be signposted as the route to Dover Castle. Just as the road reaches the castle it bends to the left as the road begins to go downhill. Just before this bend, on the left, is a minor road and this is Upper Road, which leads to both memorials. Opposite the turning is a small car-park. You might do best to park your car here and walk along Upper Road to the Blériot Memorial. As soon as you have turned into Upper Road, you pass a row of terraced houses on your left. You now have to look out for a very minor turning to the right - it looks more like a driveway than a road. On the verge of the road, by this turning, is a sign pointing to the footpath to the Blériot Memorial. To find the RFC Memorial, collect your car, and you must continue along Upper Road in the same direction as before. First you'll cross over the A2 and then the road begins to climb. 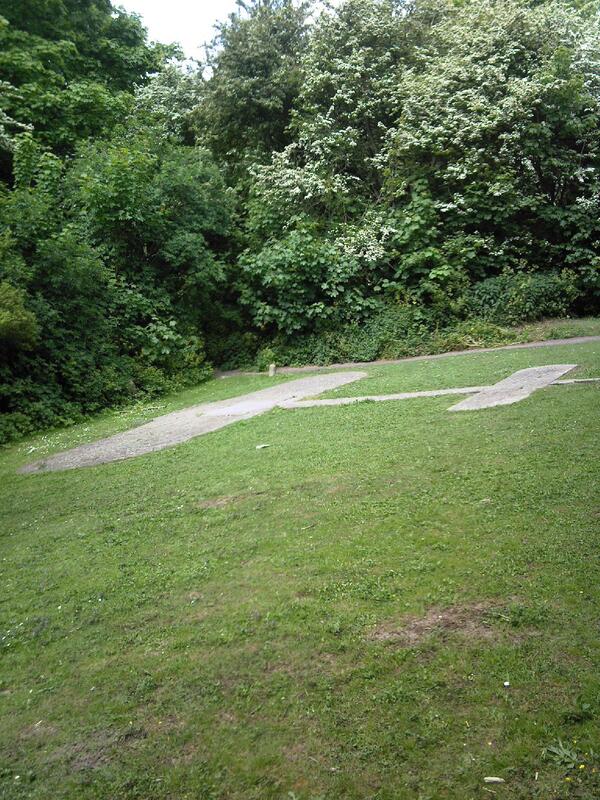 There's a very tight left-hand bend right by the entrance to the National Trust's "White Cliffs of Dover" site. Follow the road round this tight left-hander and continue until the road levels out at the top of the cliffs. The road also straightens here, and you'll see the entrance to the RFC field on the left soon afterwards, with two almost identical memorials, one on either side of the gate. On the left is a memorial to the Royal Artillery and US forces who served in the Dover area in the Second World War. The memorial on the right is the RFC Memorial. Copyright © Tom Morgan, June, 2008.